Hedge Manager can store rules so that you can easily re-use them at different times and even for different spreads. Open the Hedge Rule Builder. Click Load Rule. 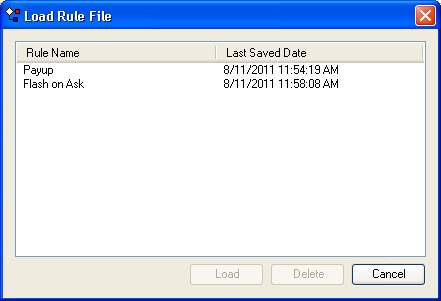 The Load Rule File dialog box displays. When viewing is complete, click Cancel. You successfully displayed the contents of the rules library. Click Save Rule As. 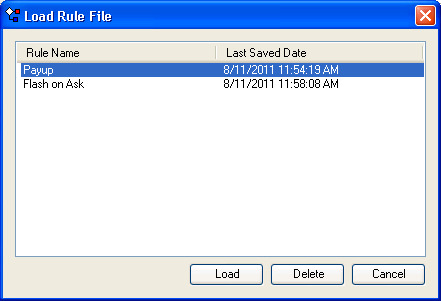 The Save Rule As dialog appears. In the Name field, type a name for the formula. Note: Hedge Manager rules are saved as a template and modifications to an existing saved rule will only apply to the rule at the location of where the rule was saved. For example, assume a rule is created, named and saved as 'OppQty100' in the Hedge Manager rules pane. If the rule 'OppQty100' was accessed and modified for a spread in the Autospreader configuration window, the saved changes would only apply to the rule in the Autospreader spread configuration and would not apply to the rule 'OppQty100' in the Rules pane. You successfully saved a rule to the rules library. Click Load Rule. The Load Rule dialog displays. Click to select the desired rule, and click Load. 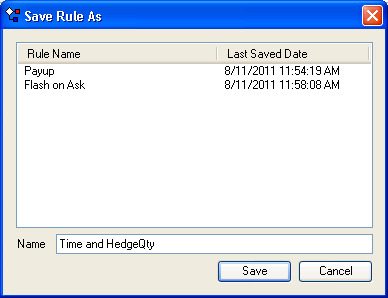 The rule appears in the Hedge Rule Builder window. You successfully loaded a rule from the rules library. Click to select the desired rule, and click Delete. You successfully deleted a rule from the rules library.